You want to leave as early as possible to set out for Etosha because it is a total drive of more than five hours. But to make a road trip great, you should give yourself time to stop where you want to, to explore new places, sip a coffee, try the cake. Setting off from Windhoek at 08:00, you should reach Otjiwarongo at about 10:30. The reason you are stopping in this nondescript farm community capital is for the legendary steaks sold at the butcher at Spar. When we say legendary, you don’t know the half of it. Trust us, we’ve done a blind test, you will know the difference. Grab a few other groceries, fill up with fuel and get back on your way. After a 45 minute drive, you will reach Outjo, where you need to stop for a mid-morning tea or coffee and cake at Outjo Bakery. Or if you know something sweet won’t do it for you, the bakery makes deliciously savoury pies that should tide you over until you get to your destination. If you had not done your grocery shopping in Otjiwarongo, there’s a supermarket behind the bakery that’s perfect for it. A lot of travellers pass through Outjo on their way to the park, so whatever you need, you will find it here. Kamanjab, “the place of stone”, is a tiny little town, more like a village really, but it has a lot of charm in the form of the service station and shop situated just off the highway on the town’s main road. The little shop’s stoep is packed with interesting memorabilia, signs and crafts, and you’ll want to sit for a while at one of the tables to just chill. Say hi to Oom Jan from us! This is the last stretch. The park is so close you can almost taste it (do let us know how a national park tastes, please). With only one hour to go until you reach the western gate of Etosha National Park, it is easy to simply focus and put the pedal to the metal. But don’t. Hear us out! Firstly, you should of course not be speeding (please), and secondly, the landscape on the way to Etosha is stunning. So enjoy the hills and twists and turns on this last stretch. And now for the finale. All we can say is, watch your speedometer. It can be very tempting to rush to the campsite, but take heed, the road from the Galton Gate to Olifantsrus is very rocky, and losing a tyre to a sharp-edged stone is a strong possibility. You have until sundown to get to Olifantsrus. You have time. So relax, and who knows? You might be welcomed with a feline or two. Arriving at the campsite, pick a spot, put up your tent really fast and head to the waterhole. That’s where you want to be for the next thirty minutes or more while you sip on an ice cold drink (which you can find at the little kiosk if you forgot to bring your own). The waterhole is a haven of activity, especially of the elephant kind. Don’t rush it. If you have a headlamp, you can cook dinner in the dark. And if you have a little gas stove, you can cook it fast. Spend your time visiting the waterholes dotted throughout the area surrounding Olifantsrus in the wild western Etosha. The best way to spot a lion is to patiently sit for a while at one of the waterholes because if they are napping you might only see them once they eventually move. Don’t lose hope! If you are really unlucky, follow a professional tour car, as the tour guides usually have very sharp eyes and are quite adept at spotting lions before anyone else. The way to Halali from Olifantsrus takes you right across the park, but don’t worry, it’s not ridiculously far. You can stop in Okaukuejo for lunch at the restaurant, take a dip in the pool at the hottest part of the day and be on your way again. Do yourself a favour and stop at the Etosha Pan Lookout Point, where you can actually get out of your car (presumably because the area around the point is so flat and sparse that no self-respecting lion would think of sneaking up on you). The second half of the day can be spent winding your way to Halali Resort, which has lovely chalets and campsites spread out under the mopane trees. Take a walk to the waterhole come dusk and watch the theatre of the wild play out below. Halali is a great resort and campsite, as it is a little less crowded than the others, perhaps because it is not so close to the gates. But this central position can work in your favour. 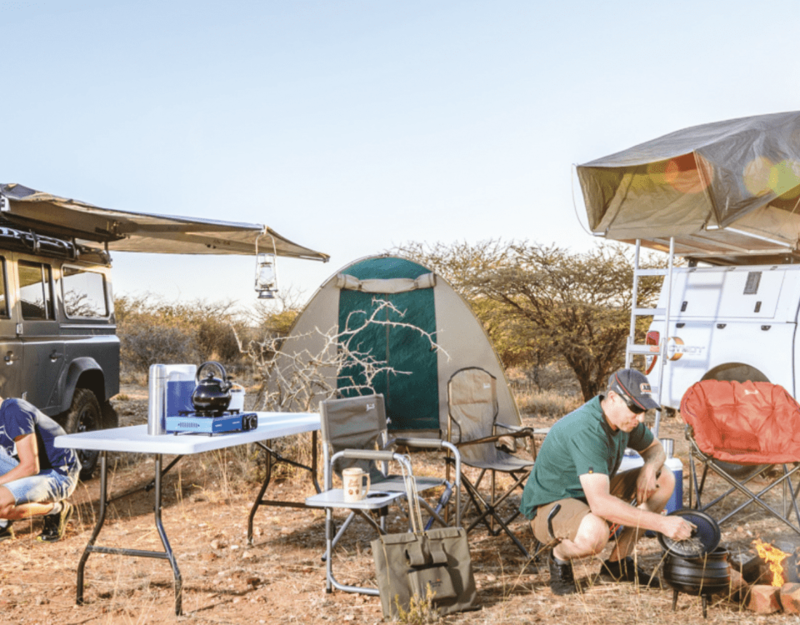 With Halali as your basecamp, you can easily explore the eastern side of the park, as well as the area north of Namutoni, although it might be a bit of a stretch. Try, though, as Fischer’s Pan north of Namutoni is a great place to do a spot of bird watching after good rains in March or April. Don’t forget to pay a visit to the historic fort at Namutoni. Keep in mind that you will have to check out of the park, but that shouldn’t take too long. You should arrive in Tsumeb right in time for coffee (and cake, of course). Stop by the Teater Huis boutique hotel, which serves delicious slices of cake plus more savoury meals. The hotel still hosts shows in its theatre and has a ton of character. We don’t know what to tell you… We have come to the end of the journey, the final stretch of your road-trip. Make it last. Pick a great playlist, turn up the volume, and sing your heart out. Ignore the weird looks from the other drivers on the road – as well as your passengers.